Hard work, determination, and sheer force of will have started you on your way-to keep going, you need dependable guidance, flexibility, and a plan. 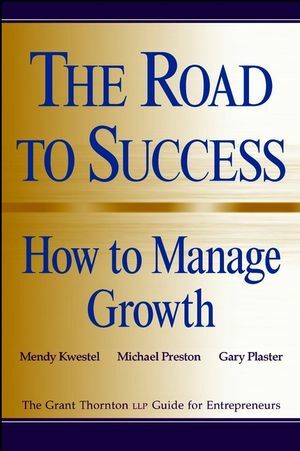 If you want to drive your company toward manageable, unlimited growth, The Road to Success is the only way to go. GRANT THORNTON LLP is the sixth-largest U.S. accounting and management consulting firm, with more than 2,800 partners and staff in 48 U.S. locations. MENDY KWESTEL is a partner and the Director of Entrepreneurial Services for Grant Thornton's New York area offices. MICHAEL S. PRESTON was Management Consulting Partner in the New York office of Grant Thornton LLP. He is currently a professor at Columbia University's Graduate School of Business. GARY A. PLASTER is a partner of Management Consulting for Grant Thornton LLP and is the National Practice Leader for the Grant Thornton Strategic Consultancy. The Problems of Growing Entrepreneurial Companies. Developing a Management Information Reporting System. Implementing Information Technology and Controls. Finding and Retaining Good People. Forming a Board of Directors.